This post is part of a four part series: Part 1, Part 2, Part 3, Part 4. 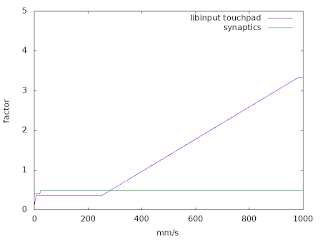 In the first three parts, I covered the X server and synaptics pointer acceleration curves and how libinput compares to the X server pointer acceleration curve. 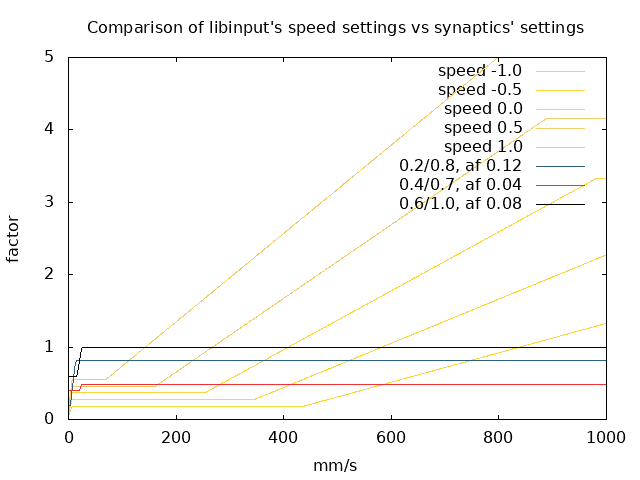 In this post, I will compare libinput to the synaptics acceleration curve. 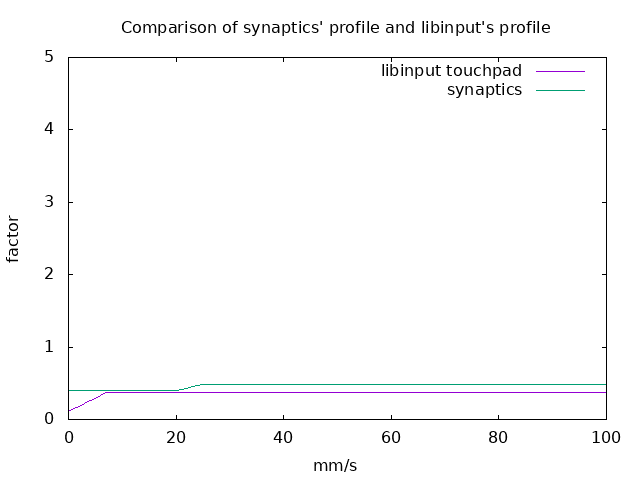 But this one doesn't tell the whole story, because the touchpad accel for libinput actually changes once we get faster. So here are the same two curves, but this time with the range up to 1000mm/s. These two graphs show that libinput is both very different and similar. Both curves have an acceleration factor less than 1 for the majority of speeds, they both decelerate the touchpad more than accelerating it. 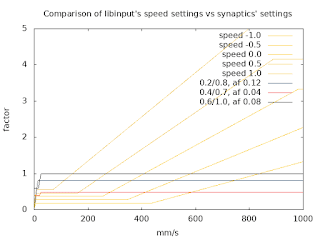 synaptics has two factors it sticks to and a short curve, libinput has a short deceleration curve and its plateau is the same or lower than synaptics for the most part. Once the threshold is hit at around 250 mm/s, libinput's acceleration keeps increasing until it hits a maximum much later. 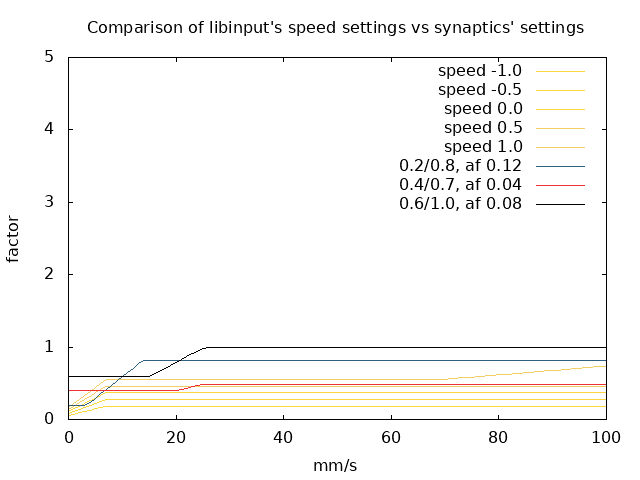 So, anything under ~20mm/s, libinput should be the same as synaptics (ignoring the <7mm/s deceleration). For anything less than 250mm/s, libinput should be slower. I say "should be" because that is not actually the case, synaptics is slower so I suspect the server scaling slows down synaptics even further. 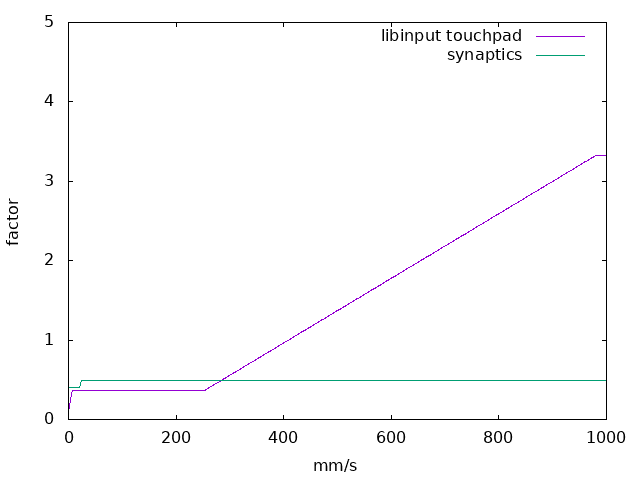 Hacking around in the libinput code, I found that moving libinput's baseline to 0.2 matches the synaptics cursor's speed. However, AFAIK that scaling depends on the screen size, so your mileage may vary. Let's overlay the libinput speed toggles. In Part 2 we've seen the synaptics toggles and they're open-ended, so it's a bit hard to pick a specific set to go with to compare. I'll be using the same combined configuration options from the diagram there. And we need the diagram from 0-1000mm/s as well. There isn't much I can talk about here in direct comparison, the curves are quite different and the synaptics curves vary greatly with the configuration options (even though the shape remains the same). It's fairly obvious that the acceleration profiles are very different once depart from the default settings. Most notable, only libinput's slowest speed setting matches the 0.2 speed that is the synaptics default setting. In other words, if your touchpad is too fast compared to synaptics, it may not be possible to slow it down sufficiently. Likewise, even at the fastest speed, the baseline is well below the synaptics baseline for e.g. 0.6 , so if your touchpad is too slow, you may not be able to speed it up sufficiently (at least for low speeds). That problem won't exist for the maximum acceleration factor, the main question here is simply whether they are too high. Answer: I don't know. 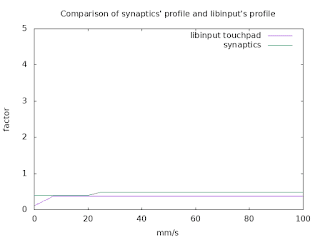 So the base speed of the touchpad in libinput needs a higher range, that's IMO a definitive bug that I need to work on. The rest... I don't know. Let's see how we go. A configuration I found suggested in some forum when googling for MinSpeed, so let's assume there's at least one person out there using it. Thank you very much for this! It has really helped me along in figuring out how to tweak my mouse settings in Linux, since many don't even seem to know the difference between "acceleration" and "sensitivity" but talk like they have all the answers. And it's fantastic to see that there is finally a way in Linux to disable acceleration but still be able to adjust the sensitivity (which I realized by looking at this which I suppose you may have wrote: https://wayland.freedesktop.org/libinput/doc/latest/pointer-acceleration.html#ptraccel-profile-flat ), since that is KEY when using a high DPI mouse without acceleration.